Pear Pie Crumble Bars are a great substitute for pie. As much as I love pie, I almost love pie bars even more. They’re portable, easier to cut, and the crust: filling ratio is weighted in the crust’s favor. Add some pears to that ratio and you’ve got one heck of a crumble bar. You know that saying, “I just flew in from <insert city> and boy are my arms tired!”? Well, I just flew in from Nashville and boy, is all of me tired. Between the two-hour time difference from the Music City to Sacramento, the late nights and early mornings, and the time change? I’m pretty much wrecked. In all actuality I’m forcing myself to write this post half jet-lagged, half food-coma’d, and half-asleep because, well. On Monday both my Monday and Wednesday posts posted at the same time and nothing has happened around here since then. As I work myself out of my Pillsbury Bake-Off food coma (details coming soon! 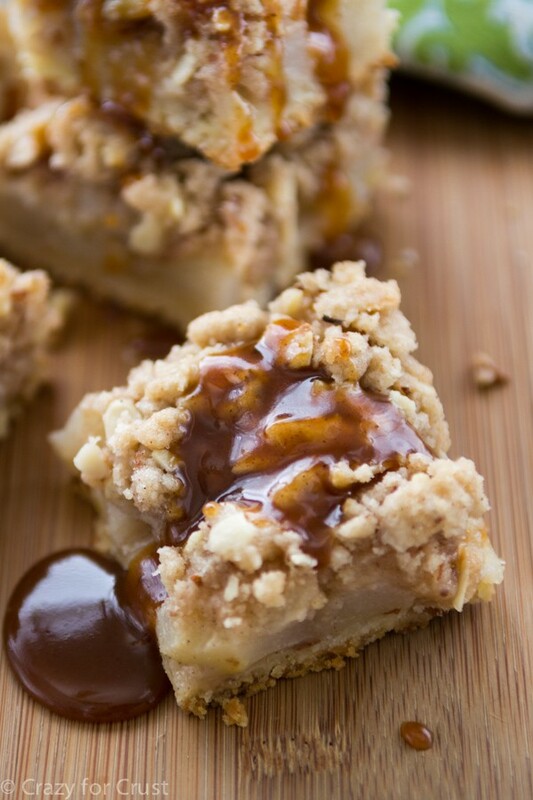 ), I’m drooling over these Pear Pie Crumble Bars. You guys, I had no idea how they would turn out when I made them and they ended up one of the best recipes I’d ever made. These are get-them-out-of-the-house-right-now bars. They’re coffee-grounds-on-top-of-the-garbage bars. They’re bars you need. When I was a kid, we ate pears from the can almost weekly. They were my favorite fruit, I think. I also remember begging my mom to let me drink Kern’s Pear Nectar in lieu of vegetables with dinner. She often said yes. I never ate pears in anything, like pie, until college. And I have to admit: when I had my first slice of pear pie one year I was not impressed. You know how I hate apples that aren’t soft in pie? Those pears in that pie…ugh. I can still remember how I almost couldn’t swallow them. I think, because of that pie, I didn’t eat pears for years. Gah. Another thing I was totally missing out on. Because when it’s made right? Pear pie (or pear pie bars) is thebombdotcom. These pear pie crumble bars are made up of three components. First, the crust. It’s the same basic crust I use for most of my pie bars, including apple butter pie bars and my pumpkin pie bars. It’s a shortbread crust, made with butter, flour, and granulated sugar. For this recipe, I added almonds. Almonds and pears go together like PB&J. The crust is crumbly when you make it, and you can use a stand or a hand mixer for the recipe. When you press all the crumbles together in a pan it creates a nice thick shortbread crust. Second, the crumble topping. Again, it’s a similar recipe that I use for all my crumbles, like my blueberry slab pie or almond chocolate cherry pie bars. More butter, more sugar, and more almonds create a crunchy crumbly top you’ll love. And, of course, the final layer in these Pear Pie Crumble Bars : the pears. Get good pears that you love. All pears differ in size, so pay attention to the pounds I list in the recipe. I used Harry & David pears because they’re some of the best ones I’ve ever had. Have you ever tried them? 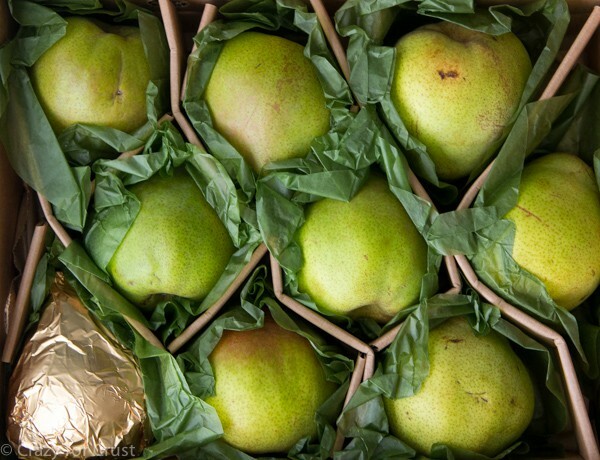 They grow most of their pears in Oregon in the Rogue River Valley. It’s gorgeous there and the weather is perfect for pears. In order to combat the issues of too-crunchy pears in the bars, I partially cooked the pears before adding them to the crust. I cooked them like I cook my apples for pie: I boiled them in a little water until they just started turning translucent. Then drain them well (a few times; as they cool more liquid will release), stir them up with some cinnamon and sugar, and sandwich them between crust and crumble. The pears finish cooking in the oven for the perfect texture – not too soft and not crunchy. They’re just right. 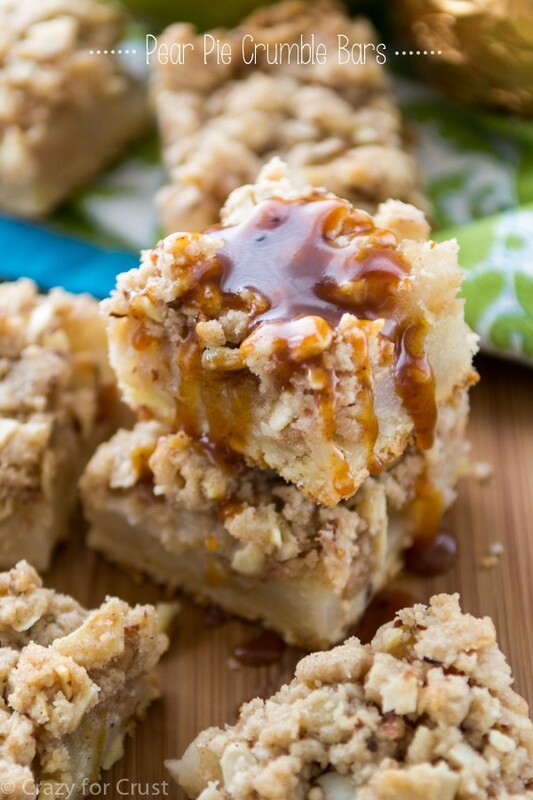 These Pear Pie Crumble Bars remind me a lot of apple pie, but the flavor is distinctly pear. You can serve them with ice cream or whipped cream. You can eat them by themselves. But if I were you, I’d douse them in caramel sauce. Because caramel sauce (homemade or store bought) is goooooood. Make these Pear Pie Crumble Bars for Thanksgiving. I promise you’ll love them!! 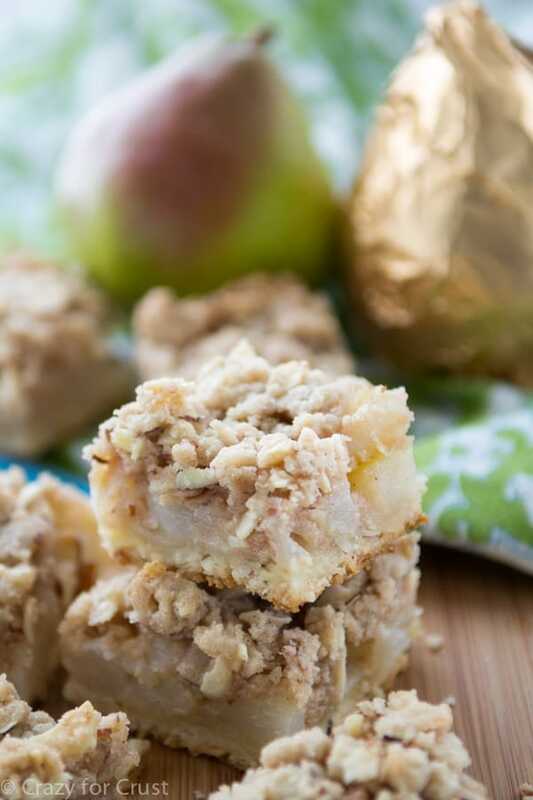 These bars are a perfect way to use your pears! 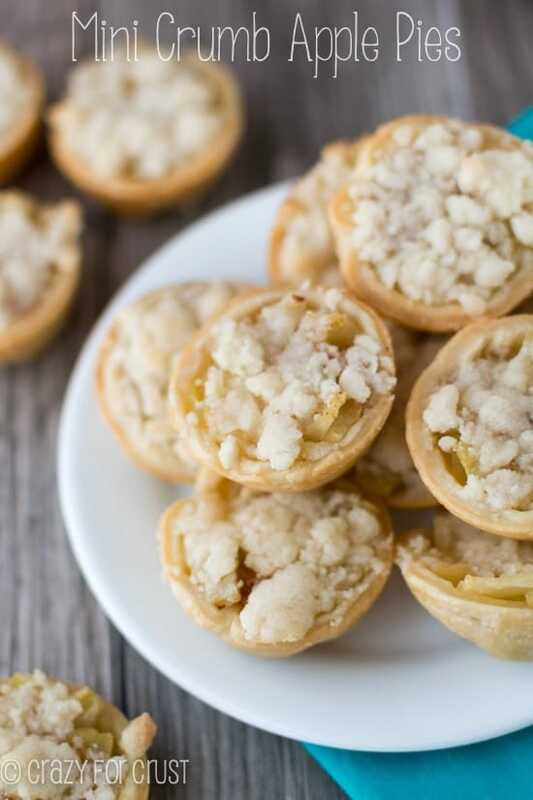 A shortbread almond crust is filled with partially cooked cinnamon sugar pears and topped with an almond crumble. 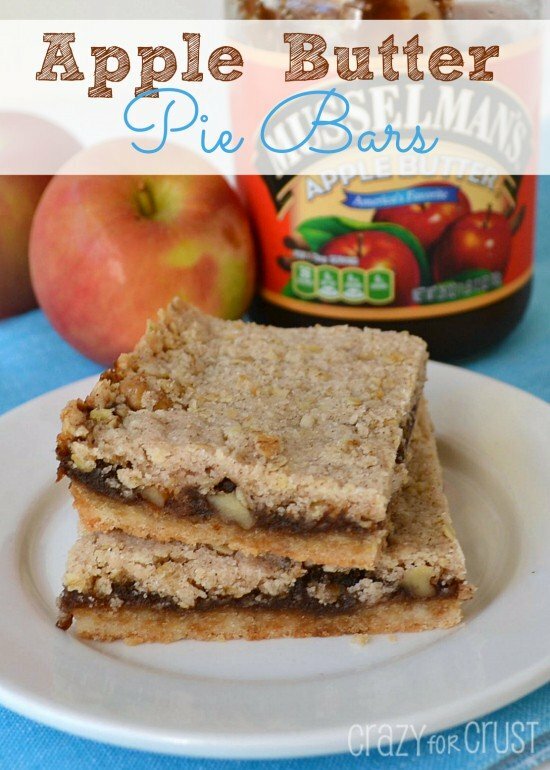 Serve these with caramel sauce for a decadent twist on a crumble pie bar! Prepare the crust by slowly mixing all the crust ingredients in a stand mixer fitted with the paddle attachment or in a large bowl using hand mixer. The mixture will be crumbly and if you are using a hand mixer you may need to use your hands to break up any large chunks of butter. Press the crust in the prepared pan and bake for 15 minutes. Prepare the filling by placing the diced pears in a medium saucepan. Fill the pan with water so that half the pears are covered. Cook over medium heat, bringing to a boil then simmering for about 5 minutes until the pears just start to turn semi-translucent. Drain well. Make the topping while the pears are cooking: you can use the same bowl you used for the crust. Use a stand or a hand mixer to cream the butter and sugar. Add the flour, almonds, and salt and mix slowly. The mixture will be somewhat crumbly. Right before the crust comes out of the oven, drain the pears again, then sprinkle the pears with the cinnamon and sugar called for in the filling. I was not sponsored for this post, but Harry & David sent me pears as a thank you for doing a giveaway for them. No one says no to pears: especially H&D ones! 🙂 This post contains affiliate links. I love anything crumble, so I HAVE to try these. These would probably be a great thing for Thanksgiving this year, something different that what I normally do. Lovely! Have I told you lately that I love you? I guess so, I feel like I couldn’t stop saying how great you are at the Bake-Off! This recipe just serves as more proof. I love pie bars wayyyy more than pie. And the caramel on here look fab! And pears, such an underdog fruit and I love pears! So nice to see you bake with them! Love pears! 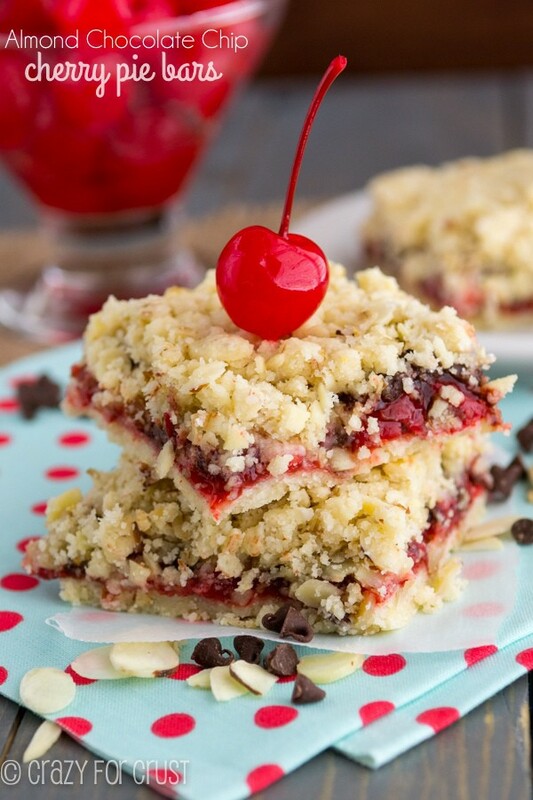 I can definitely see myself making these crumble bars Dorothy, they look delicious! I about died when I saw these on IG! They look heavenly! That caramel dripping off the top…too much. Who am I kidding, there is never enough caramel. Just like there is never enough crust or crumble. Well done, Dorothy. Well done! First of all, I want to devour my screen in an attempt to eat these bars! 😉 And secondly, I also felt wiped out after this last trip! But, oh how I love our crazy busy awesome jobs! 😉 Pinned! Ohh these look absolutely delicious! I love a good crisp or pie with fruit and these sound great to try. Thanks for the opportunity. I really need to make more with pears.. I haven’t made anything on my blog with them and I seriously love them to pieces. And those Harry & David ones are absolutely mind-blowing. LOVE these! These bars turned out great. I used pecans instead of almonds, which I measured whole. I also made them in two loaf tins so I multiplied the recipe by 1 1/3. It is good to note that they will last 2 days out of the fridge but 4 days in the fridge. Awesome! Thanks for letting me know the changes you made! Can I use canned pears? In case anyone is wondering—using ripe Bartlett pears works perfectly without pre cooking. They were soft but not mushy or overripe. I increased the recipe by 1 1/2 and put it in a 13×9 pan. It took quite a lot longer to bake since the pears were not hot. But it turned out awesome and with perfectly soft cooked pears. Was a big hit with my extended family! I think this is an awesome recipe! I like even more cookie crust so I double the recipe and swap out some of the flour for almond flour in addition to the sliced almonds. I also used nearly overripe pears and didn’t do the cooking step. It worked out wonderfully. Thank you very much for posting this recipe, I absolutely love it and it is extremely user friendly and adaptable to diet restrictions/preferences.